Cynergy E-Bikes is on the cusp of something big in Portland. Rich and Ruth Ellen, the owners of Cynergy E-Bikes, are demonstrating just how fun and easy clean transportation is by e-bike. By making Cynergy E-Bikes a hub for learning about, experiencing and purchasing an electric bike, they are setting the stage for an electric bike revolution to begin in Portland. It’s a Bike Plus More: Of course, no write-up of an e-bike shop would be complete without a test ride, and I got one! (Thank you Ruth Ellen for taking me out.). An e-bike, or electric assist bicycle, is just that in my estimation. It is a bicycle with an electric motor that either helps you pedal or can be operated without pedaling. They also look an awful lot like regular bikes, with chains, rings, brakes and gear shifts, with the subtle addition of a battery pack and a small motor. I got to test ride two of the models. The Sweet Ride: I did not know what to expect before I got on the bike, but boy was I pleasantly surprised. As an avid cyclist myself, I was immediately hooked as the assist kicked in when I started to pedal. It felt almost as if my force on the pedal was giving the bicycle extra juice to move along, instead of the bike helping me. In fact, simply riding a few blocks around the neighborhood was loads of fun, and I was thinking about how easy it would be to ride one of these uphill or with a heavy load, while still experiencing the joy of being outside and cycling. An E-Bike for Any Ride: Cynergy E-Bikes has an electric bike for just about any type of cyclist. There are city/upright e-bikes, hybrid road e-bikes, mountain e-bikes, and folding e-bikes. 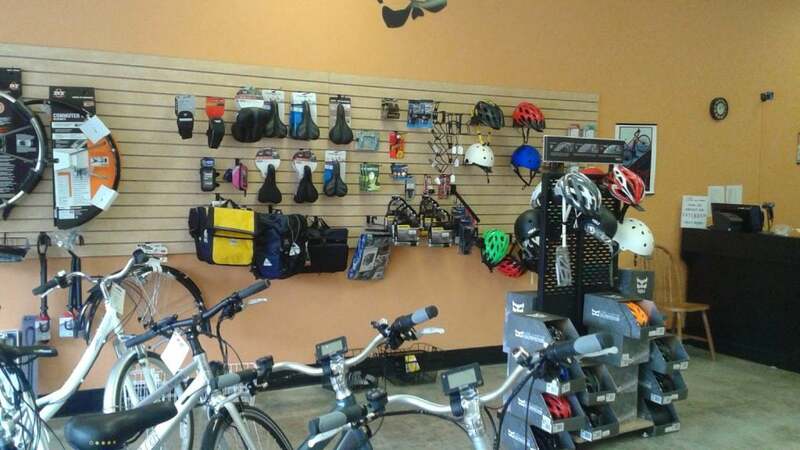 They also stock kits to convert more specialized bicycles, such as recumbents, into electric assist bicycles. The e-bikes are suitable for just about anything, including commuting, cruising, touring and general transportation. 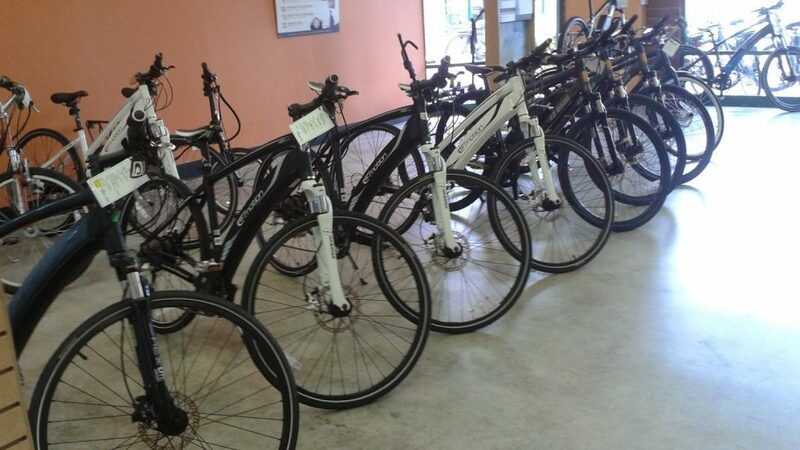 The e-bikes come in different sizes, colors, and price ranges, so there is bike to fit anyone’s needs. Creating Cynergy: The idea for Cynergy E-Bikes began in Ohio. Rich had a career in marketing and technology in the alternative fuel industry. Like many entrepreneurs, he was ready for a change that gave him more control over his life. He’d read that electric bicycles were a new area for big growth. In fact, they were already taking off in Europe, where 1 out every 9 new bicycle being sold is an electric bike (and higher numbers in the Netherlands). Joining the electric bike revolution seemed like a natural choice. The Best Place for Cynergy: Of course, electric bicycle sales in the US are much, much lower than in Europe, but are also beginning to grow. Rich did his homework, and identified the best market for selling electric bikes in the US. Is it no surprise that Portland turned out to be the best place? So, Rich and Ruth Ellen moved to Portland to open their electric bike shop together. 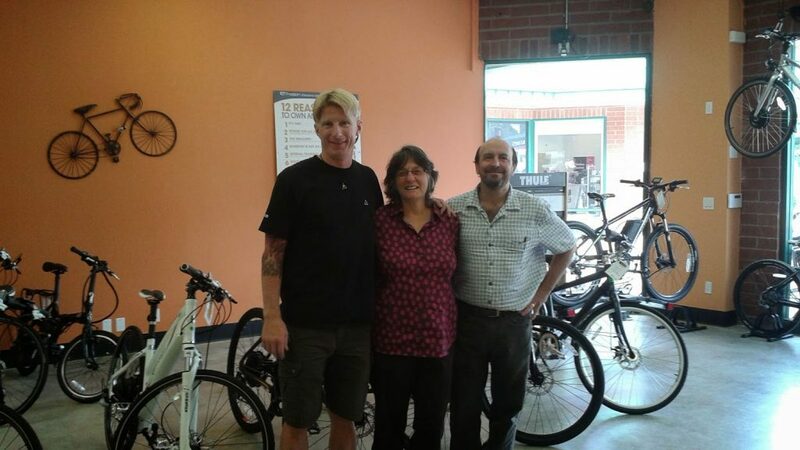 The Beauty of E-Bikes: Rich and Ruth Ellen are not only attracted to the growth potential of selling electric bikes, but also just simply love electric bikes! As cyclists themselves, they note many advantages electric bikes have. The bikes are actually safer and more fun to ride. (Read more about the safety and other advantages here). The Joy of Riding: Apparently, people who test ride them feel the same way. Rich tells me he loves seeing the happy faces after people take their first test ride. He notes that their shop is a happy place, where customers are enthusiastic about their new bikes. Customers often report that they end up riding their e-bike more frequently than they thought because it’s just so much fun. Go Clean: It’s awesome when fun and good for the environment come together. An E-bike has a really low carbon footprint, and really looks clean compared to a car. In fact, Rich calculates that an e-bike has about 1 1/2% of the carbon footprint of a car, and even close to 0%, depending on the source of the electricity to charge the battery. Another way to look at it is it costs about $.05 per 30 miles to operate an e-bike, or the equivalent of 1000 – 2000 mpg. Now that’s also good for the pocket book! It’s Really a Bike: You can easily reach speeds above 25 mph while pedaling with some of these bikes, but to be an electric bike, it must not exceed 20 mph without pedaling. E-bikes are classified as bicycles, and not motorized vehicles. This means you can ride an e-bike in a bike lane or on a multi-use path like the Springwater Corridor. However, a person must be 16 to ride an e-bike and must wear a helmet, regardless of age. Also, e-bikes are not allowed on sidewalks. The Charge: The battery, of course, is a key component of the e-bike. Most batteries provide about 30 miles of riding and can be charged in a standard electrical outlet. Each battery can be charged 500+ times before it begins to wear out, and you will need a new battery about once every 5 years. If the battery dies, you’re not stranded! You can also ride an e-bike without the electric motor assist, just like a plain ole bike. 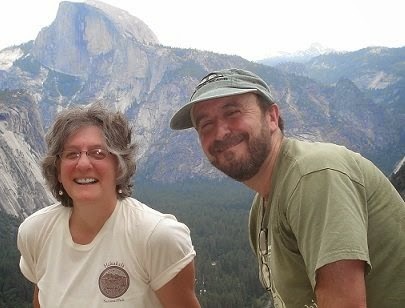 Portland is Home: I asked Rich if he and Ruth Ellen were happy with their move to Portland. And yes, they do in fact love it here. They ride their bikes regularly, of course, and also enjoy hiking, canoeing and wine tasting. They try to be outdoors as much as possible. Rich reports they don’t even mind the weather or riding in the rain! “It’s better than the snow,” says Rich. Of course, you need the right gear, and Cynergy E-Bikes can get you set up to ride in any weather Portland has to offer. 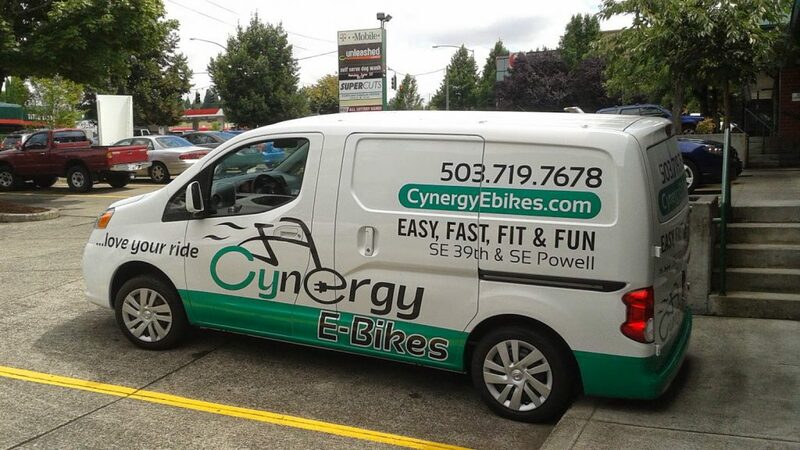 Visit Cynergy: Cynergy E-Bikes is located on SE Powell and Cesar Chavez Boulevard. There’s ample parking in front of the store (and bus stops nearby). The back door leads to quiet streets for test riding and access by bicycle. Cynergy also delivers purchased bikes to clients in Portland. There are several bikes in the show room to see and to test ride. I know Rich and Ruth Ellen would love to see you and help you experience the joy of riding an electric bike. Learn more at the website: cynergyebikes.com.